Recently I had a session of WHOOP classes with two beautiful, journeying women. Each was going through a major life change. Six months earlier Cheryl had lost her husband, and father to her teenage son, to a heart attack. Susan was in the midst of the final decisions and signing of divorce. During one class, I listened as they pondered their different perspectives of the empty hangers in their closets. Contemplating this a bit more on my own, I saw how each of their perspectives, as well as mine with my divorce and the death of my parents, had spiritual wisdom in it. For Cheryl the empty hangers that once held her husband’s clothes were full of sorrow and grief. They were a reminder of what she had lost. She had items of her husband’s she just couldn’t part with in honor of him. And others she held on to in case her son could ever use or want them as he got older and more his dad’s size. At that time she could not even think about filling the hangers or space that his leaving left in her closet and life. Susan loved the empty hangers. She was busy repainting and redoing the closet. She was looking forward to reorganizing it. Her marriage had been rocky and unpleasant. She did have grief over the loss of dreams, the hardships of joint custody with her children, and the pain of thinking about her soon-to-be-ex with another woman, but she had a secure sense that in the long run, this was the best for all involved. The empty hangers in Susan’s closet were a sign of relief and excitement. During my own divorce I came across a magnet that said, “The barn burned down. Now I can see the moon.” The empty space and empty hangers became one small odd way for me to see the moon–I would have more space and take over the whole closet! Silly and shallow as it seemed, the empty hangers were the start of looking at the brighter side of a situation I had to accept. I remember cleaning out my mom’s clothes after she died. Her clothes were donated to a shelter for women who were starting a new life. This was a fitting tribute to my mom and bittersweet. The empty space and empty hangers were a sign that someone was recieving a blessing towards their renewed hopes and dreams. Three weeks ago my dad passed. His closet has not been cleaned out yet, but I did go look at what was there. The closet was a history of my dad—shoes and ties from work, golf shirts and hats from golfing trips and tournaments, sweat shirts and jackets from colleges he supported because of his kids and grandkids, a wild shirt I only saw him wear in retirement. Thinking about the empty space and empty hangers for my dad, I could see them as a reminder to carry on what he inspired in me—hard work, do something you love and are passionate about even if it is a hobby, support others in their dreams, and have fun. Death, divorce, and heartache are painful to our hearts whether it is a tragic or an expected death, whether it is a divorce or a break up of our own choosing or another’s. Living a spiritual or whole hearted life does not mean we become emotionless and not feel the sorrows of life. I’d say we actually become more emotional! If you are looking for more joy in your life, expect to feel more sorrow. Welcoming, accepting, and moving through the pain in a way that is most loving for God, our self, and others is living wholeheartedly. This is when there is joy in sorrow and where grief turns into rejoicing. The empty hangers give us some clues on how to do this with death, divorce, and heartbreak—allowing the space to grieve, seeing the relief and joy, being accepting of what is, looking for the blessings, embracing the excitement of creating a new life, learning from the person and experience, honoring what was, believing and holding on for the rejoicing to come. 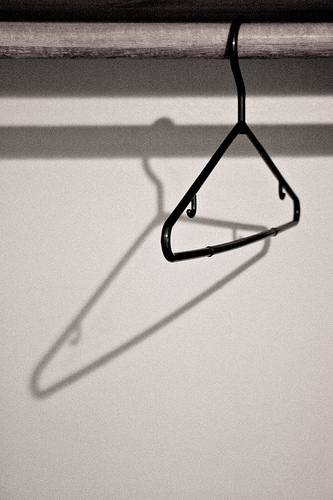 What empty hangers have you had in your life? What was your perspective of them? What did they teach you about living wholeheartedly? I’d love to hear your heart! Leave me your story! Jeremiah 31:13 The young women will dance for joy, and the men—old and young—will join in the celebration. I will turn their mourning into joy. I will comfort them and exchange their sorrow for rejoicing. John 16:20 I assure you, most solemnly I tell you, that you shall weep and grieve, but the world will rejoice. You will be sorrowful, but your sorrow will be turned into joy. Hebrews 12:11 For the time being no discipline brings joy, but seems grievous and painful; but afterwards it yields a peaceable fruit of righteousness to those who have been trained by it [a harvest of fruit which consists in righteousness—in conformity to God’s will in purpose, thought, and action, resulting in right living and right standing with God]. Psalm 30:11 You did it: You turned my deepest pains into joyful dancing; You stripped off my dark clothing and covered me with joyful light. A Buddhist thought: Suffering is our teacher, it’s through our own experience and ability to contemplate suffering that we learn the First Noble Truth–The Joy Hidden in Sorrow. “Silly and shallow as it seemed, the empty hangers were the start of looking at the brighter side of a situation I had to accept.” This is such a great way of looking at it. Sometimes we simply have to accept that things have changed and that we need to move forward. I enjoyed your post. Thanks for sharing. The empty hangers is a striking visual of what is lost or gained in some cases. I see it as a loss, the loss of a relationship longed for but accepting what it is. I have longed for a sister to sister relationship and each time I have an interaction I am hopeful it will lead to another that will move the relationship forward, it does not. I am learning that the ’empty hangers’ will remain. So I will choose to hang on them what she is willing to give me, even if it is a flimsy piece of lace with lots of holes! Beautiful in and of itself, because it is better than none at all.